Lot 581. L. Julius. 141 B.C. AR denarius (20 mm, 3.27 g, 9 h). Rome. 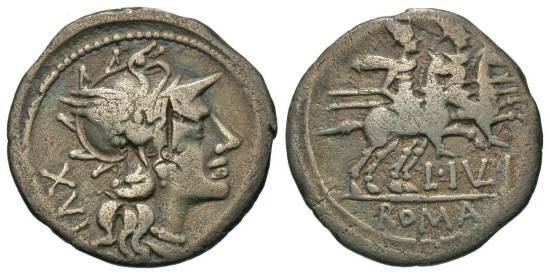 Helmeted head of Roma right; XVI behind / L · (IVL)I below; ROMA in exergue, the Dioscuri on horseback right. Crawford 224/1; Sydenham 443; Julia 1. Banker's mark on obverse. Toned. Fine.